Tokyo announces arrest in anti-Semitic vandalism case, motive still unknown. An arrest has been made in the Anne Frank diary vandalism case, Tokyo police announced, and the suspect is being cooperative. "The suspect is a 36-year-old unemployed man who lives in Tokyo," the Tokyo metropolitan police department said, in a statement translated by SBS news. "The suspect allegedly got into libraries in Suginami Ward on February 5, 2014, and ripped pages off 23 books by Anne Frank." Police added that the investigation was ongoing to find a motive for the crime and to confirm if the suspect is responsible for the full scope of vandalism carried out across Tokyo. AFP noted on Friday that Japanese authorities often refrain from naming suspects in cases where there is a question of mental competence. More than 300 copies of the diary, or publications containing biographies of Anne Frank, Nazi persecution of Jews and related material were torn at many public libraries in Japan. The news raised alarm at what some perceived to be a rightward shift in politics driving the attack. The Israeli embassy donated 300 new copies of the book to local libraries after the incident. 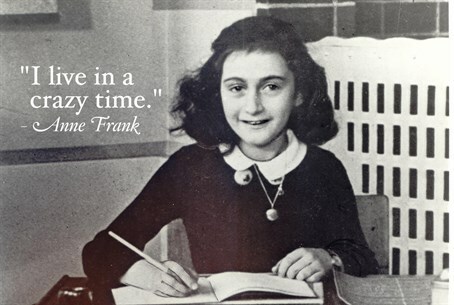 Anne Frank, a German Jew born in Frankfurt in 1929, documented her family's experiences hiding in concealed rooms during the German occupation of the Netherlands where they settled in 1933. They were caught and sent to Nazi concentration camps. Anne and her sister died of typhus in 1945. Largely homogenous Japan does not have a very big Jewish community, with the vast majority of people believing in an admixture of imported Buddhism and indigenous Shintoism.